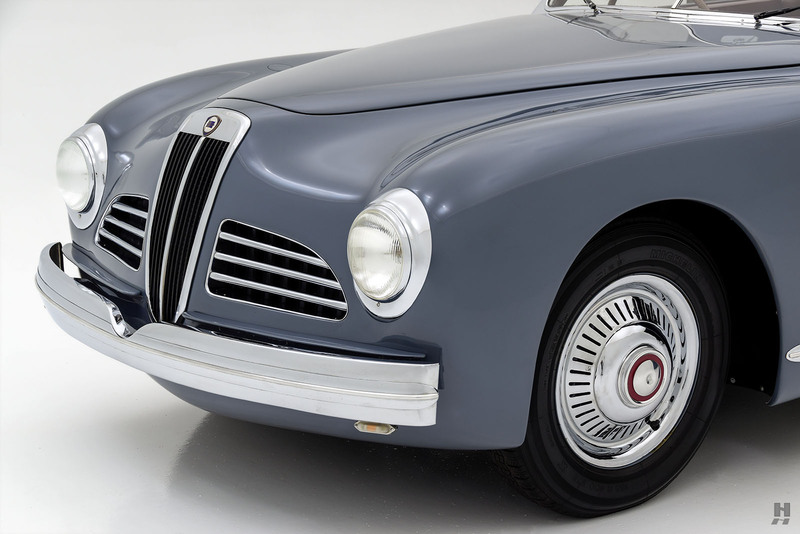 Lancia was at the height of creativity in the 1930s. 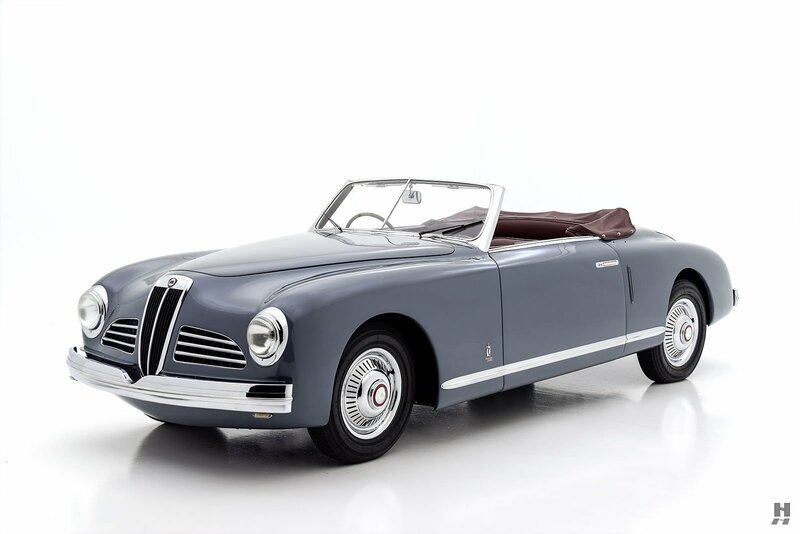 In the first part of the decade, while still under the leadership of the brilliant Vincenzo Lancia, the firm had created some of the most advanced machines of the era. 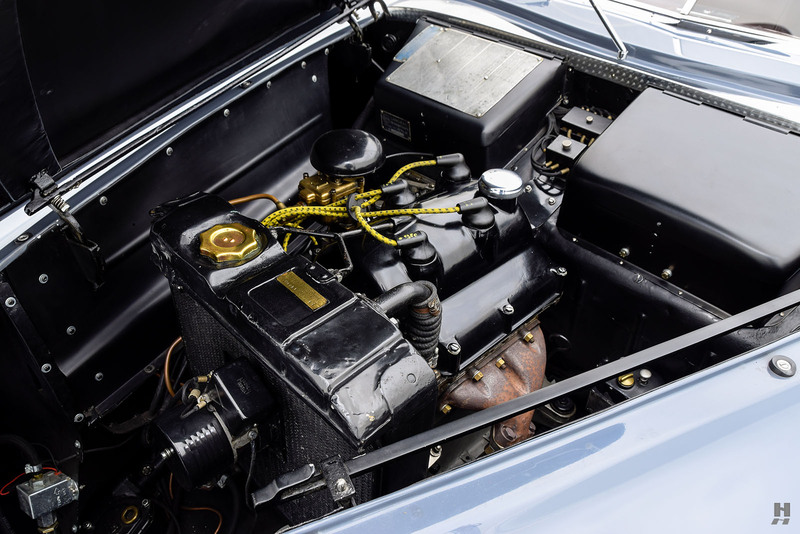 Vincenzo had previously enjoyed a successful career as a racing driver for FIAT before joining the ranks as a manufacturer in 1908. 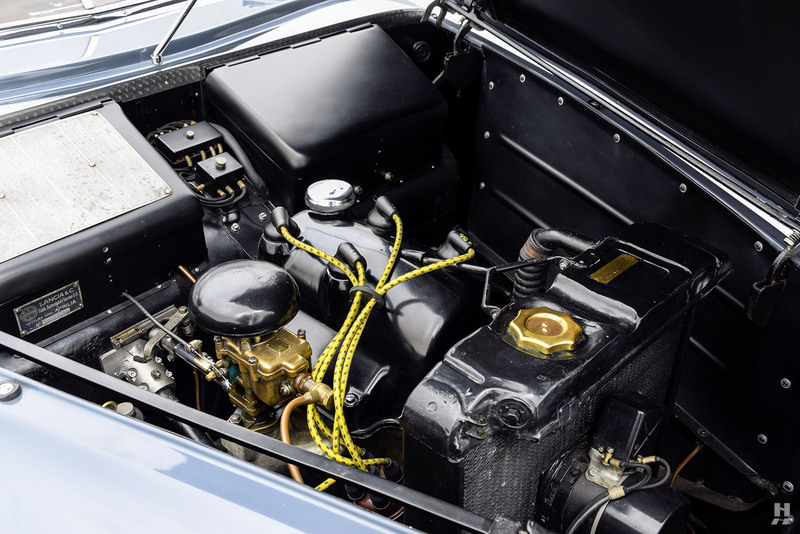 He proved to be every bit as effective an engineer as he was a driver, perhaps even more so. 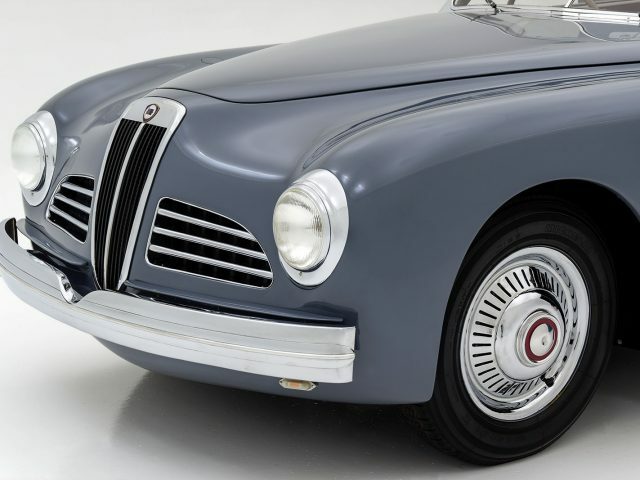 Lancia’s designs were far ahead of their time, and he pioneered the use of independent front suspension, unibody construction, and narrow V-angle engines. 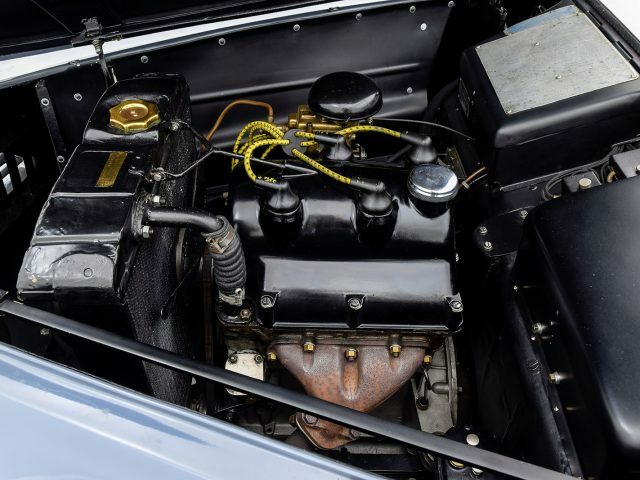 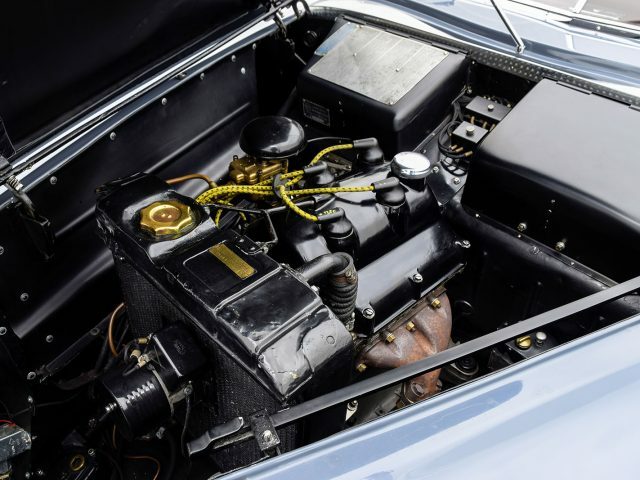 Even well after his death in 1937, Lancia cars were renowned for their innovative engineering, exquisite build quality and meticulous attention to detail. 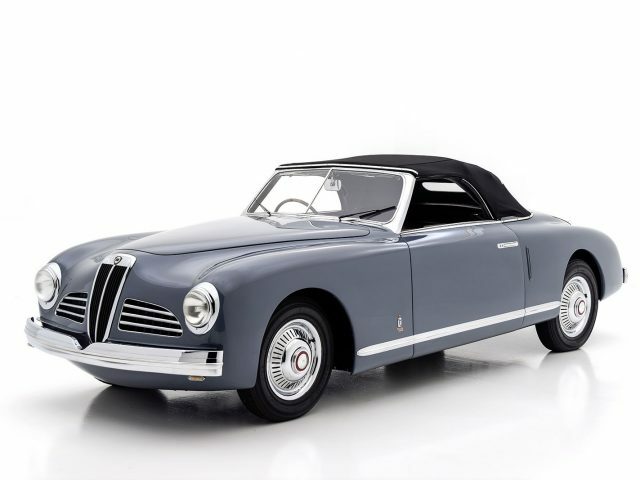 The last car Vincenzo Lancia designed before his untimely death was the Aprilia. 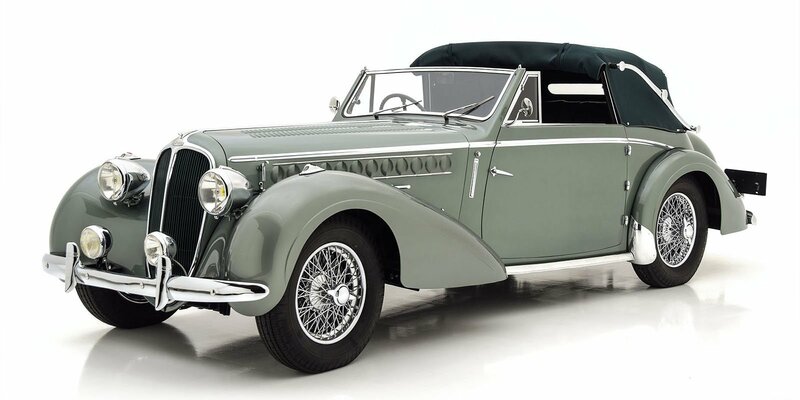 A four-cylinder mid-sized model, it was introduced in 1937 and was thoroughly remarkable for the era. 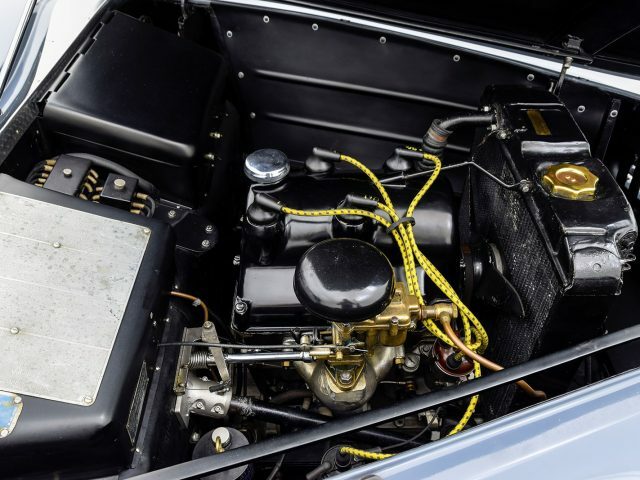 It featured four-wheel independent suspension, a narrow-angle V4 engine of 1,351 c.c. 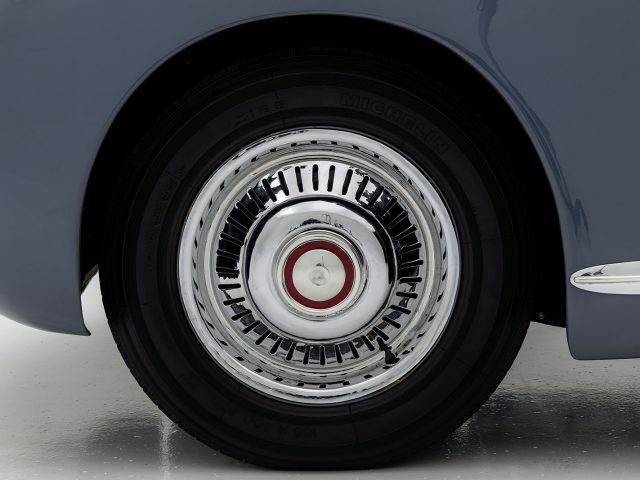 (1,485 c.c. 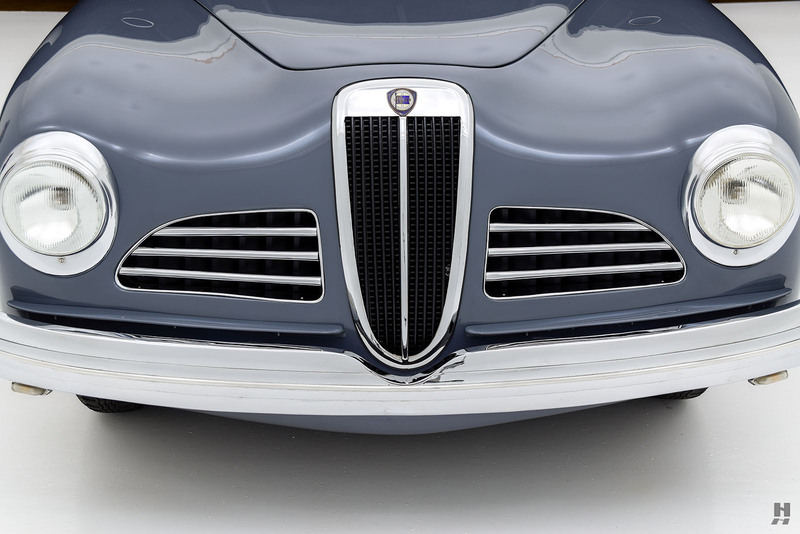 from 1939), and a clever platform chassis that was a precursor to unibody construction. 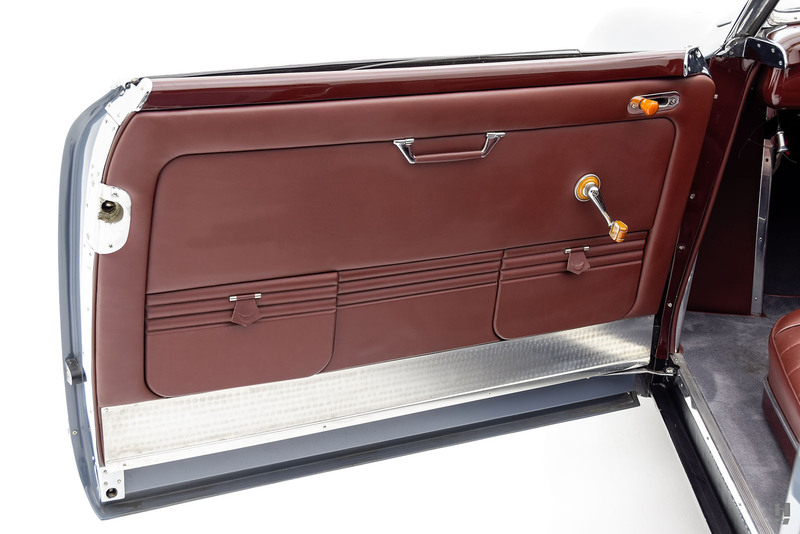 There was no traditional ladder frame; rather, a reinforced floor pan served as the main structural element. 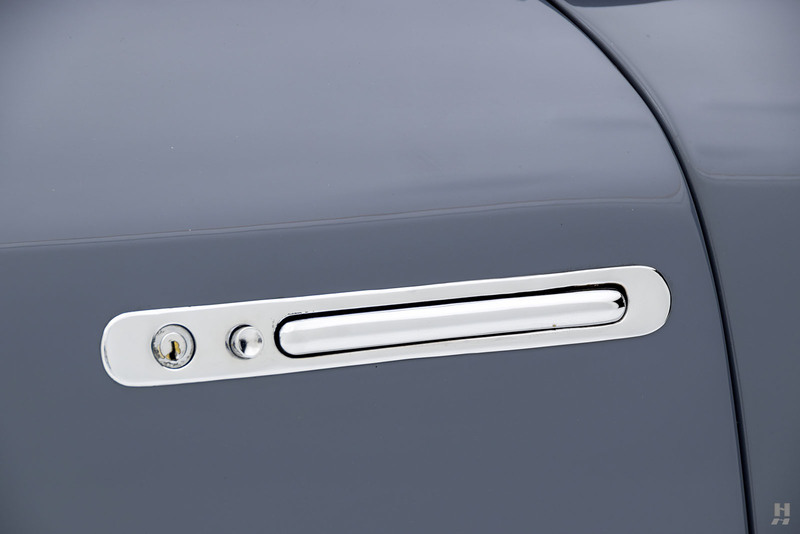 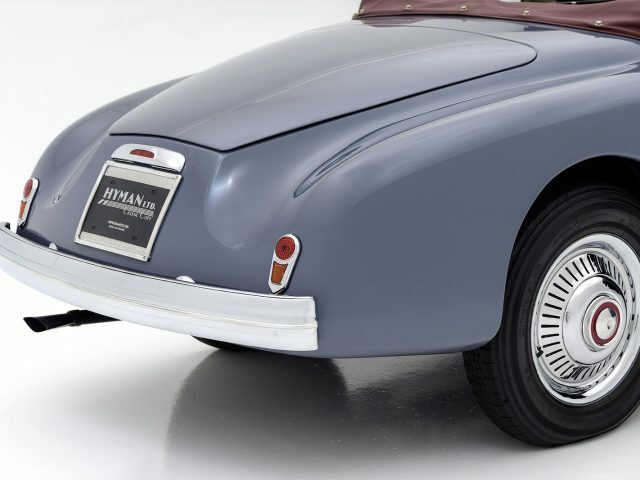 It allowed for a rigid, lightweight car that also had the benefit of being friendly for coachbuilders. 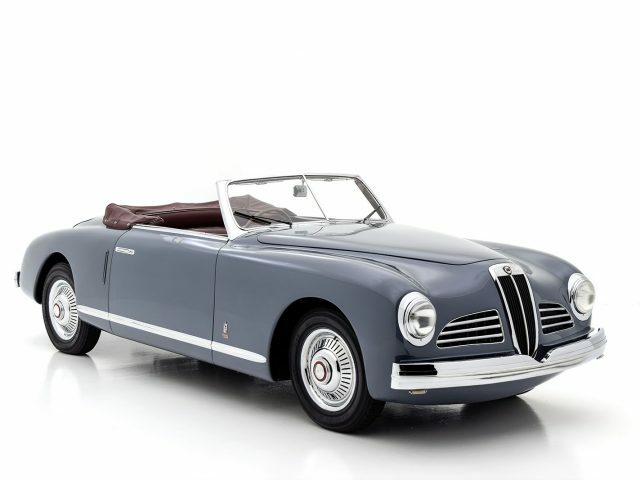 The 49 horsepower of later models was ample power to propel the little Aprilia along at speeds approaching 80 mph. 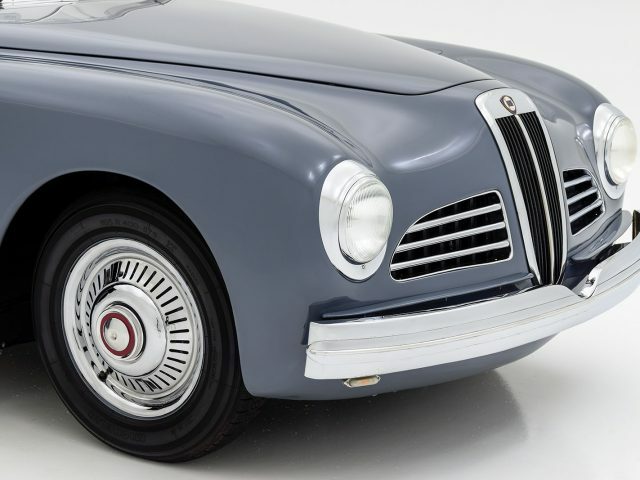 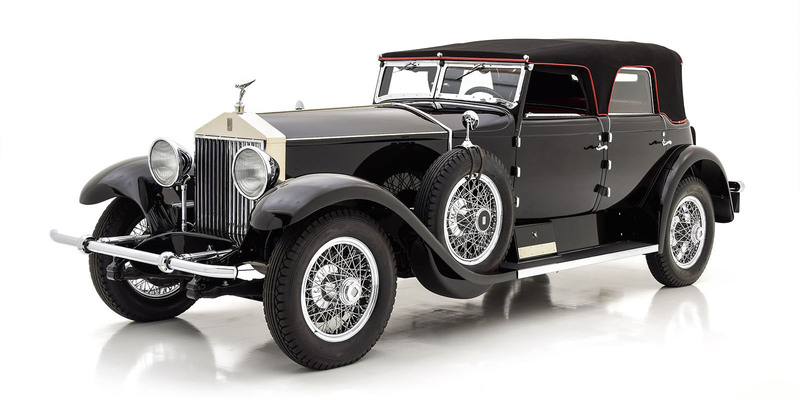 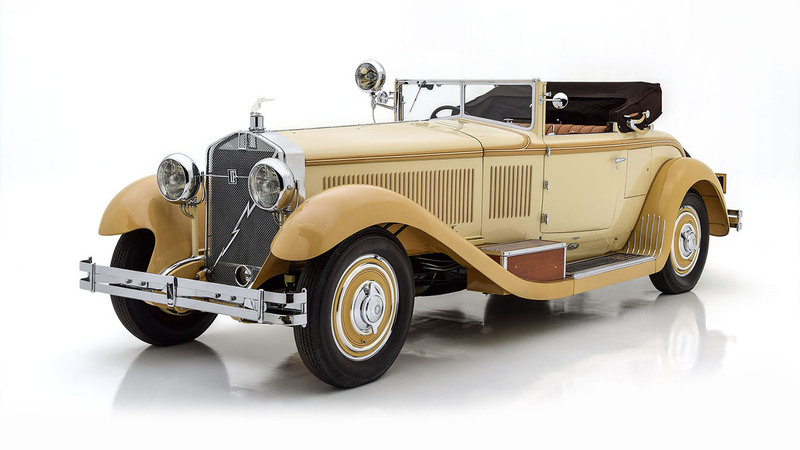 The factory offered a variety of somewhat traditional bodies, while Italy’s finest coachbuilders took full advantage of the versatile platform to create designs worthy of the highly advanced chassis. 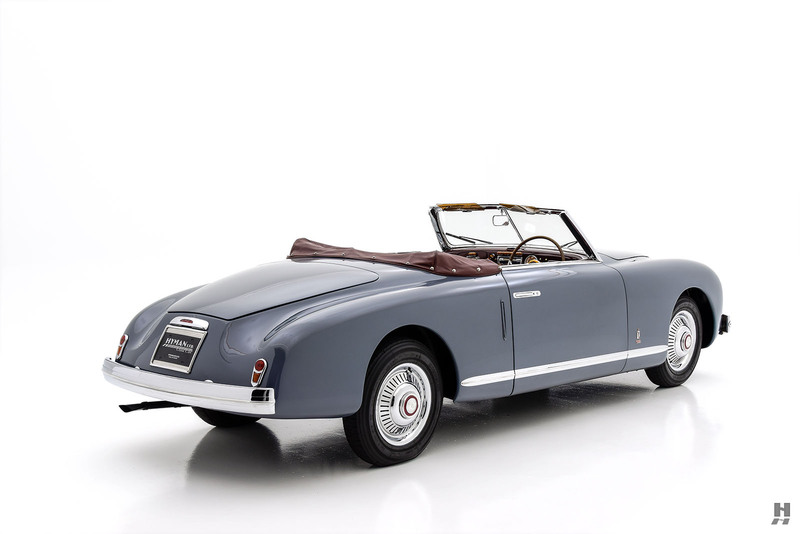 This genuinely stunning motorcar is one such creation, penned by Batista “Pinin” Farina. 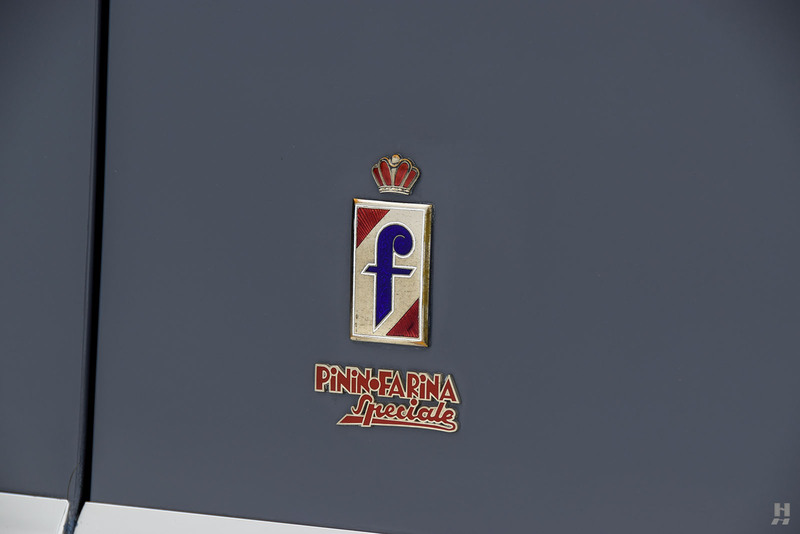 Pinin Farina had a lot of experience with the Aprilia platform, having designed saloon and cabriolet models offered through the Lancia factory catalog, as well as several bespoke models before the war. 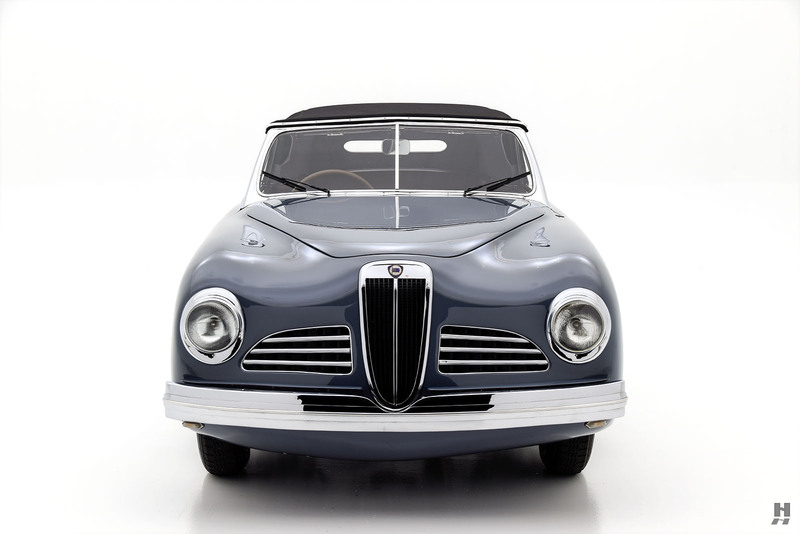 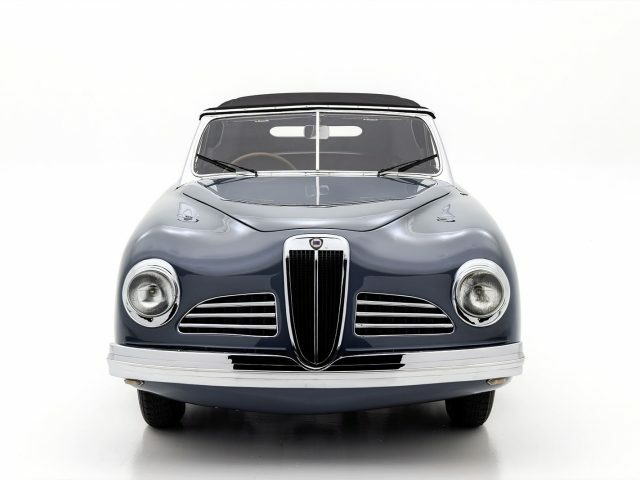 For this car, however, he created an extraordinary cutting-edge design, symbolic of the burgeoning optimism in post-war Italy. 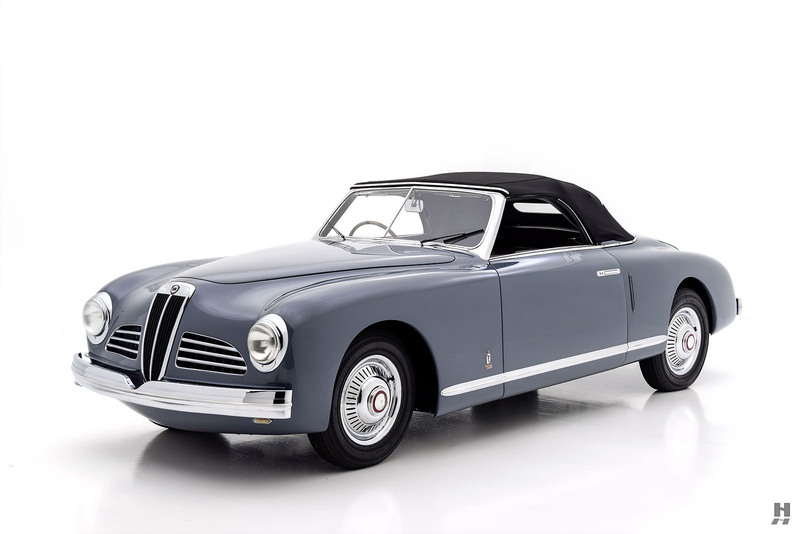 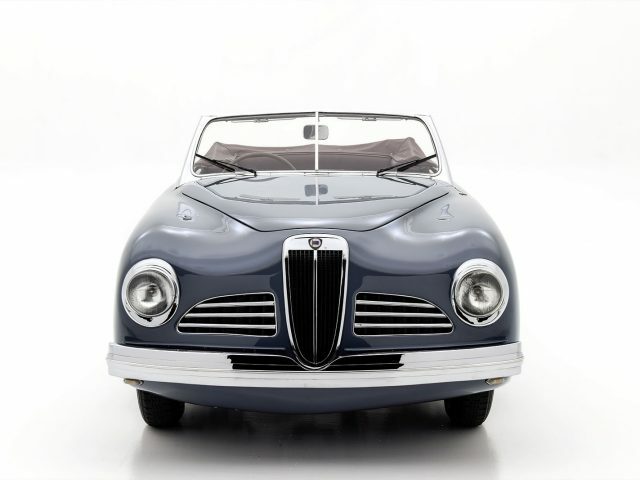 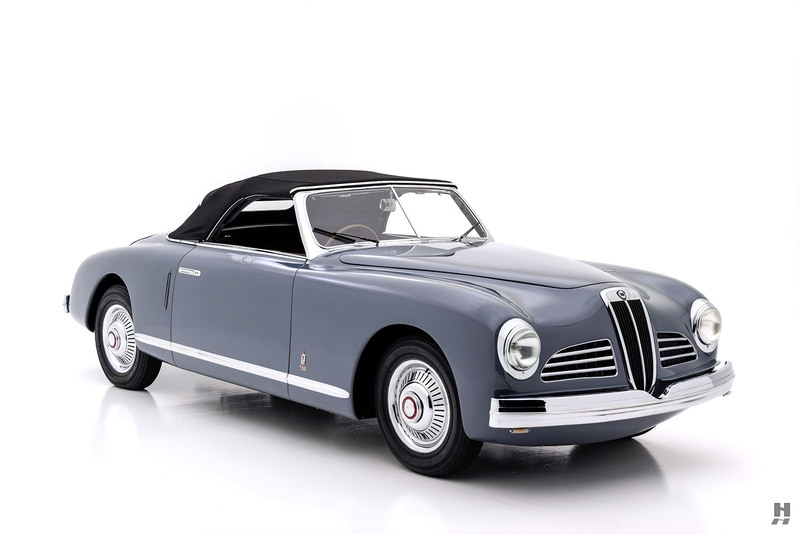 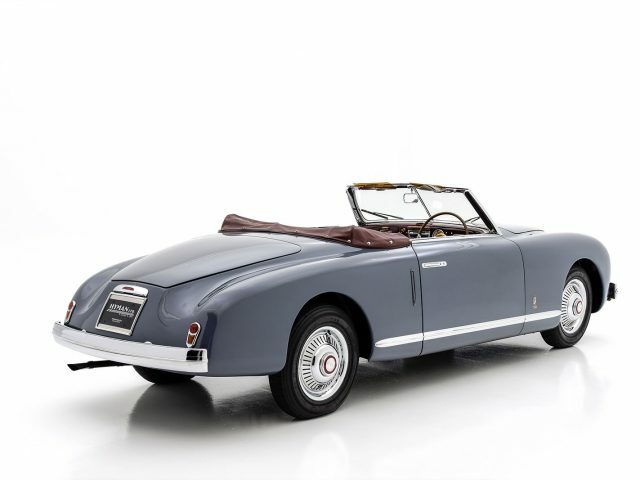 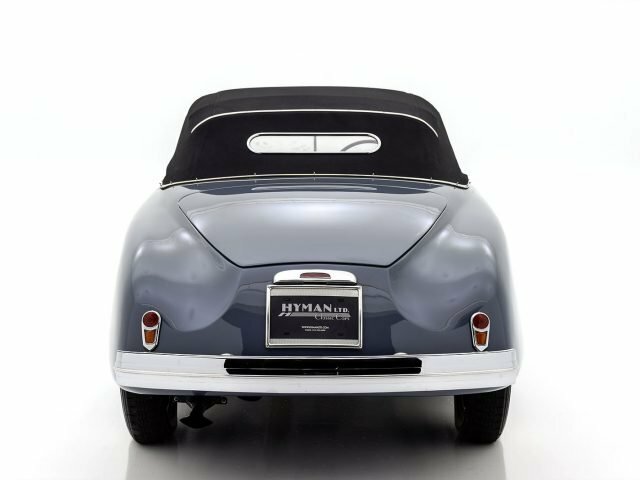 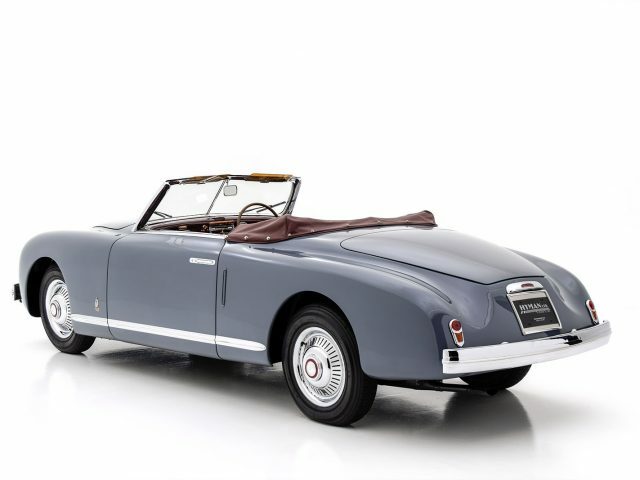 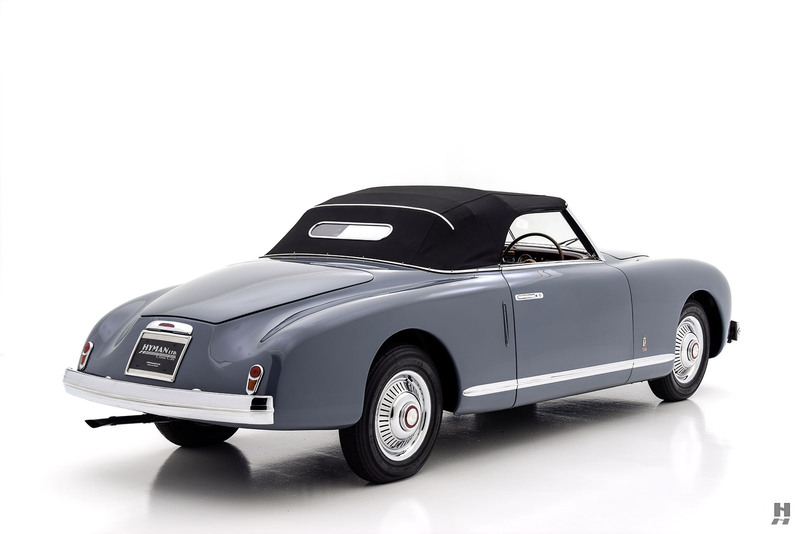 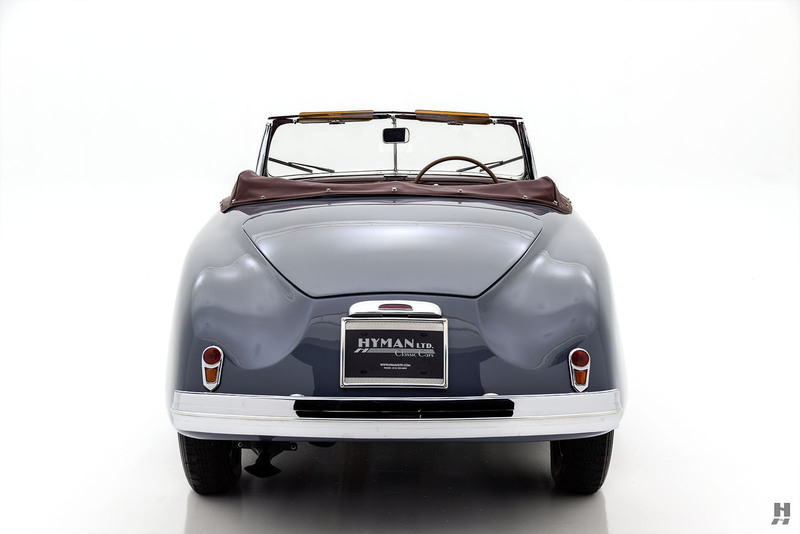 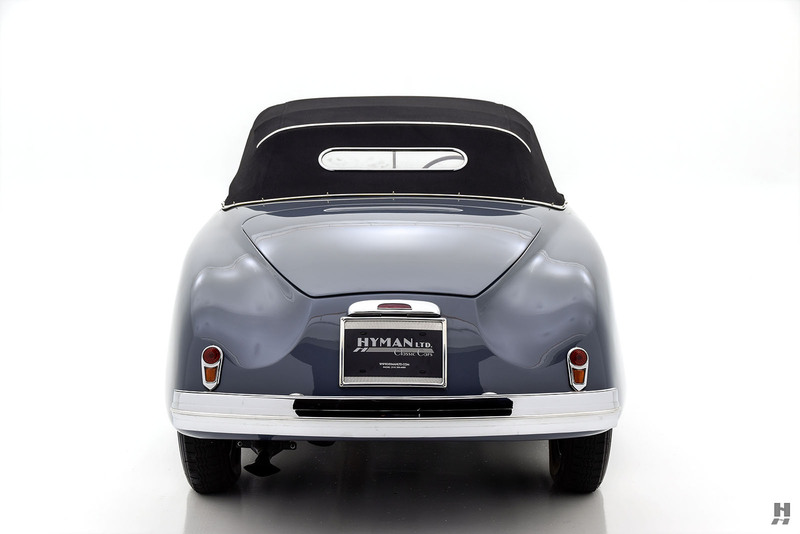 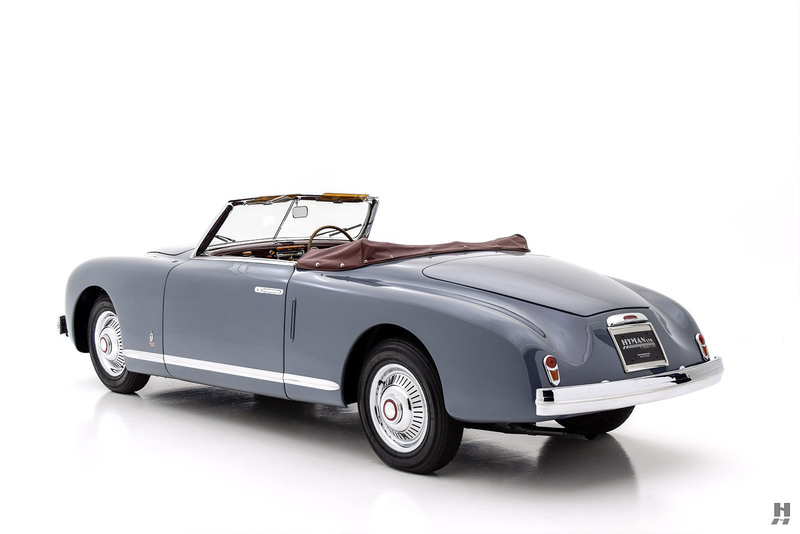 Chassis number 439-11844 was delivered to Pinin Farina, where it was clothed in this bold and modern two-plus-two cabriolet body. 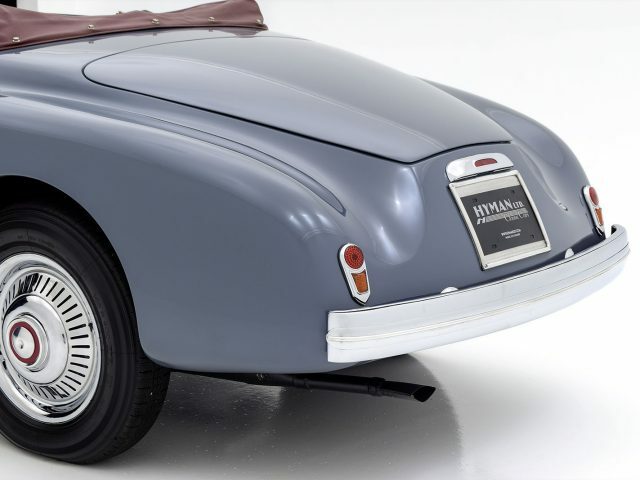 The incredible design features smooth sides, without so much as a trace of traditional separate wings that were still in-vogue for the era. 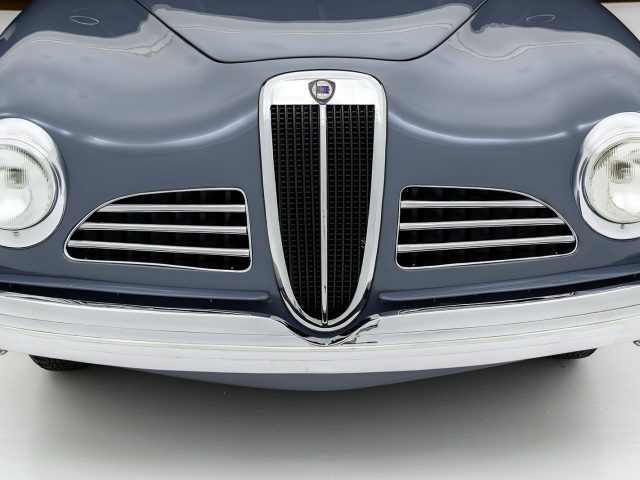 The grilles and headlamps are beautifully integrated, and the body is noticeably unadorned, with just a simple chrome rocker molding used to punctuate the clean, slab-sided bodywork. 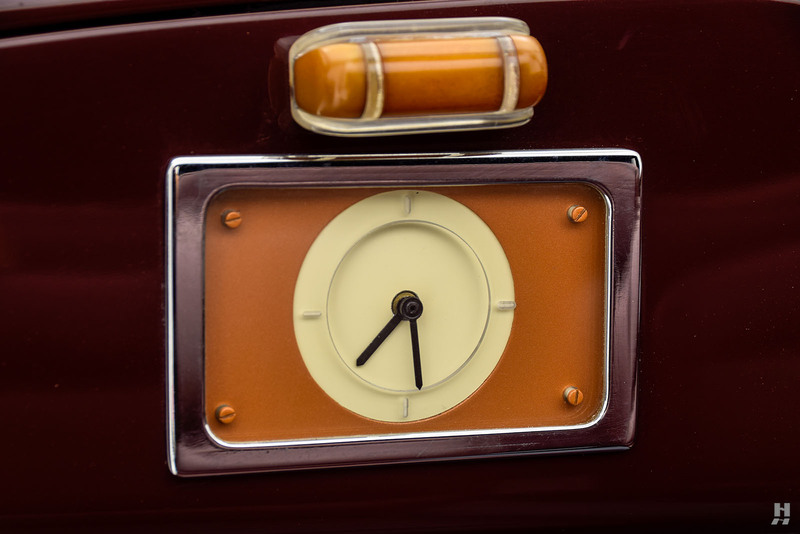 This is a remarkable display of restrained elegance and a tremendously important piece of industrial design from the immediate post-war era. 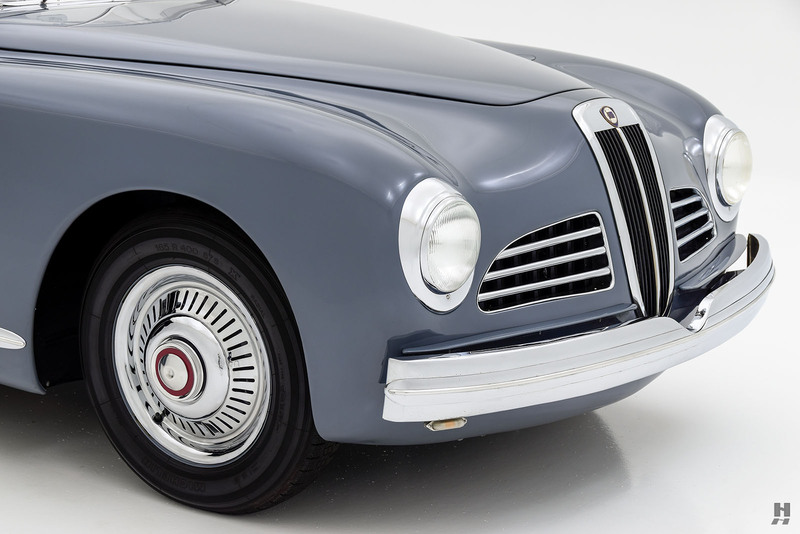 It is believed that this Lancia was shown at the Geneva Salon, finished in white or a light gray color at the time. 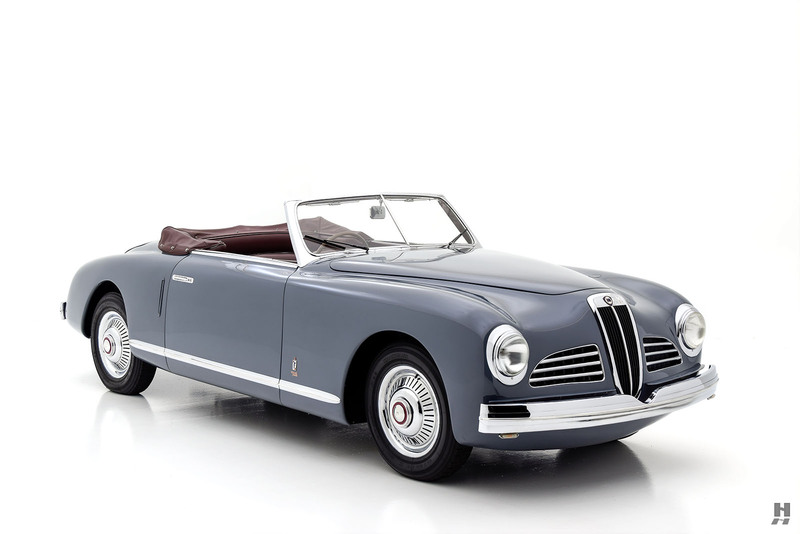 It soon came to France where it was registered from 1949-1965 in the name of Roblou, a French Lancia importer in Neuilly Sur Seine. 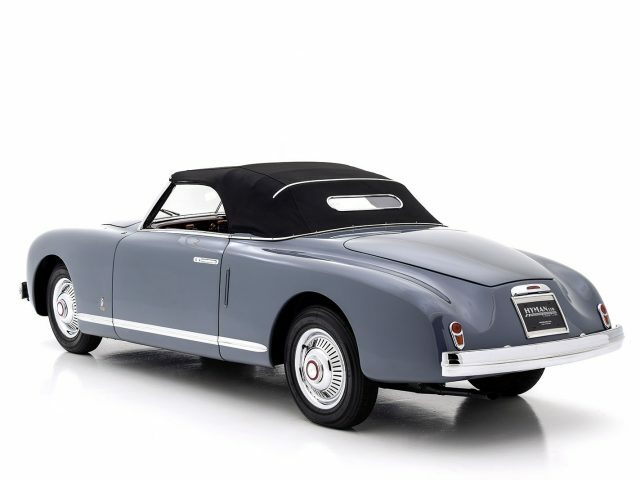 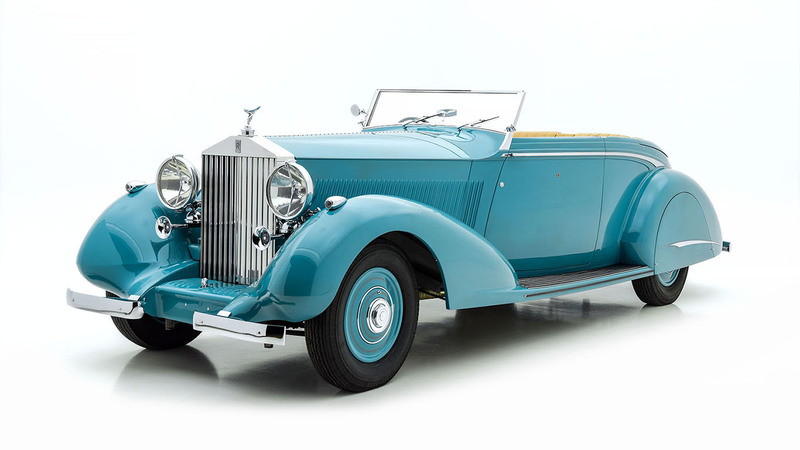 Its whereabouts became unknown for several decades until 2010, when it was discovered in Northern France by respected Belgian dealer Bernard Marreyt. 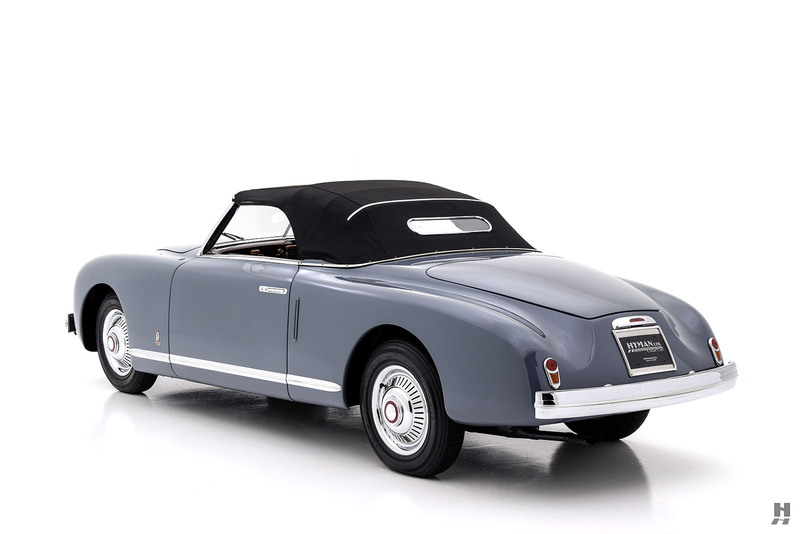 It was subsequently returned to Italy where it was treated to an exhaustive 3-year restoration. 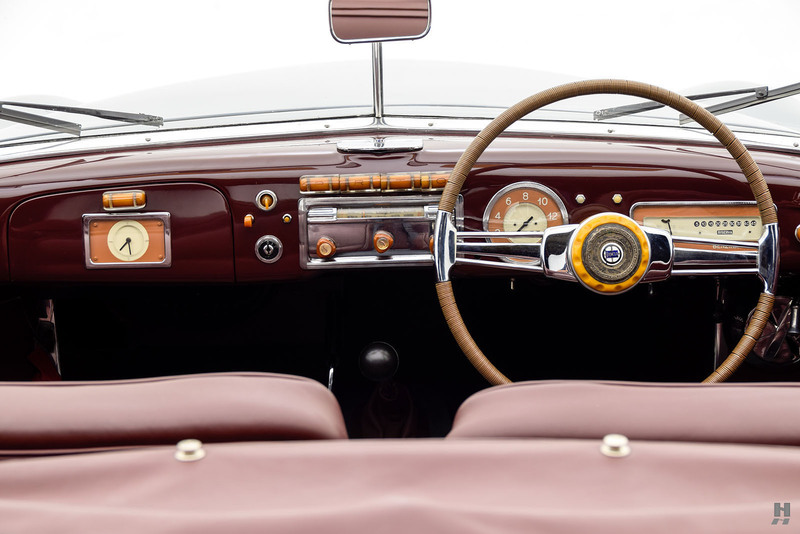 Now presented in what is believed to be the original livery of blue over a deep burgundy interior, it remains every bit as striking as the day it was presented. 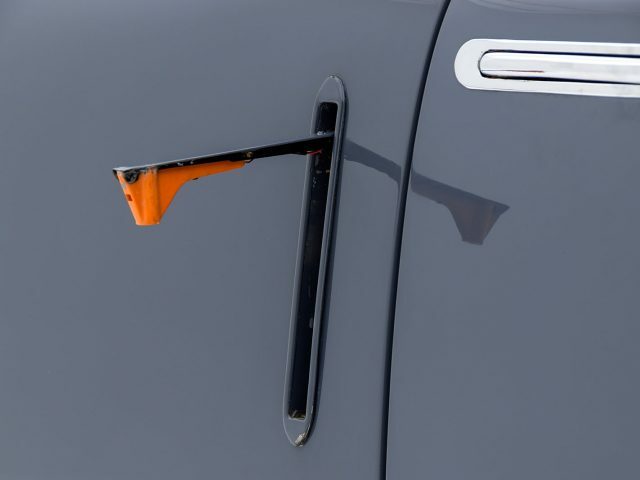 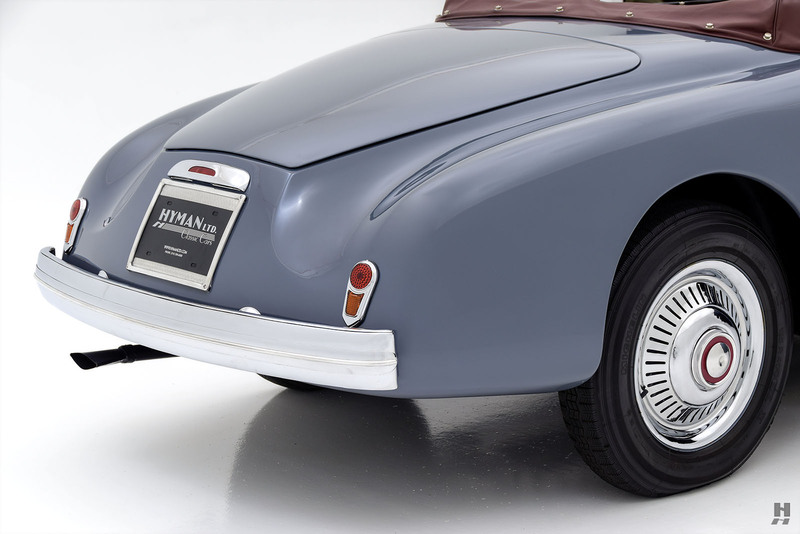 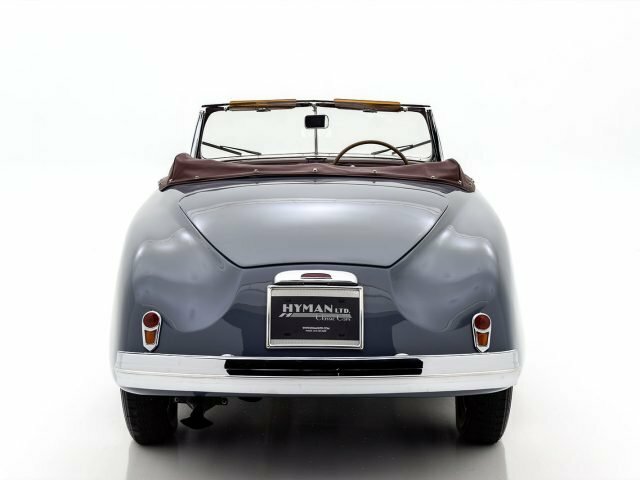 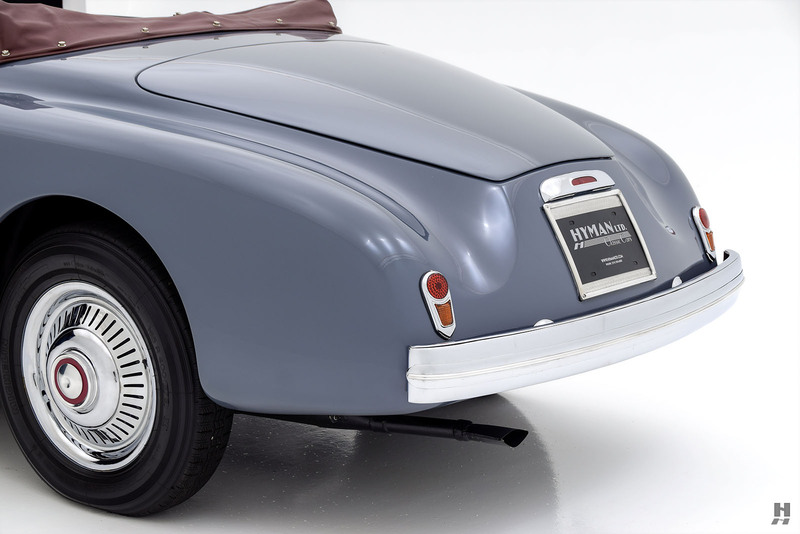 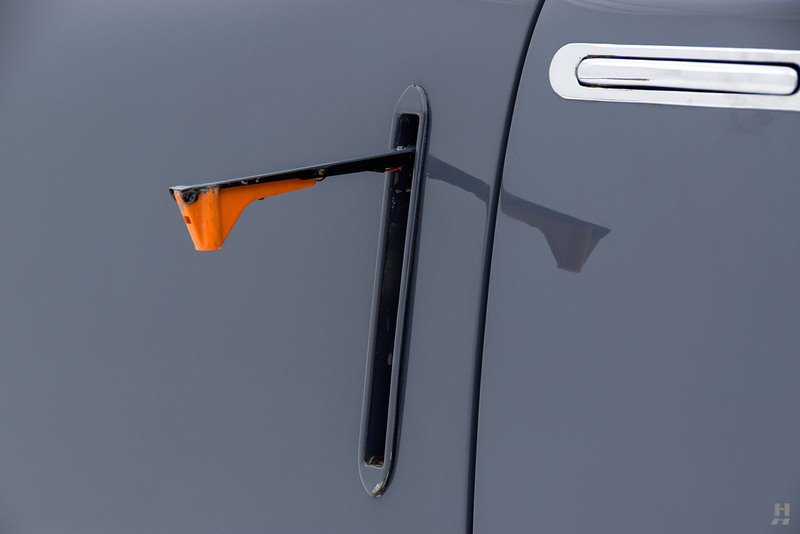 Paint quality is excellent, with the clean, unadorned coachwork appearing straight and properly fitted, doing justice to Pinin Farina’s restrained elegance. 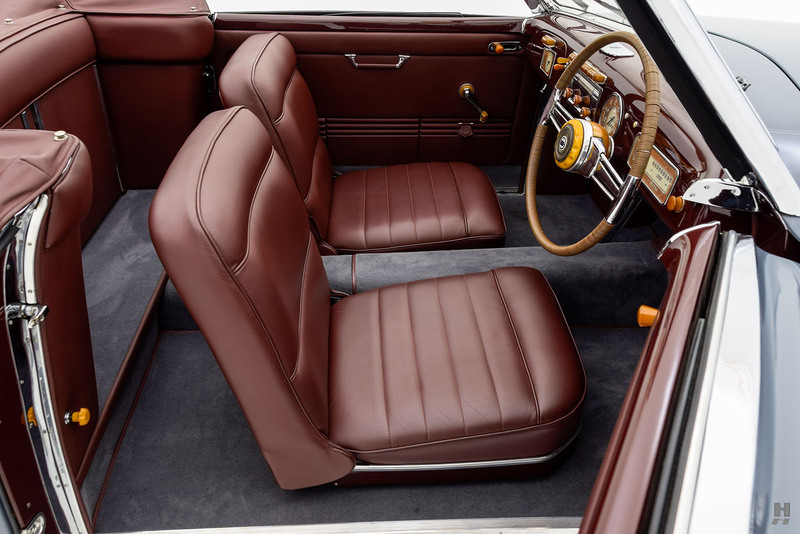 Exterior brightwork is limited, all of which present fine condition. 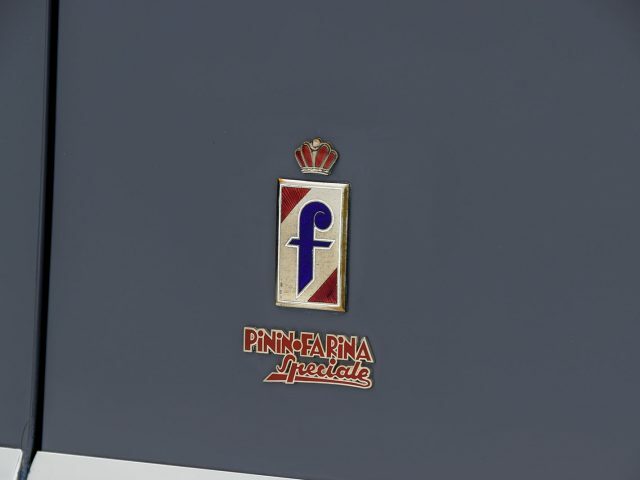 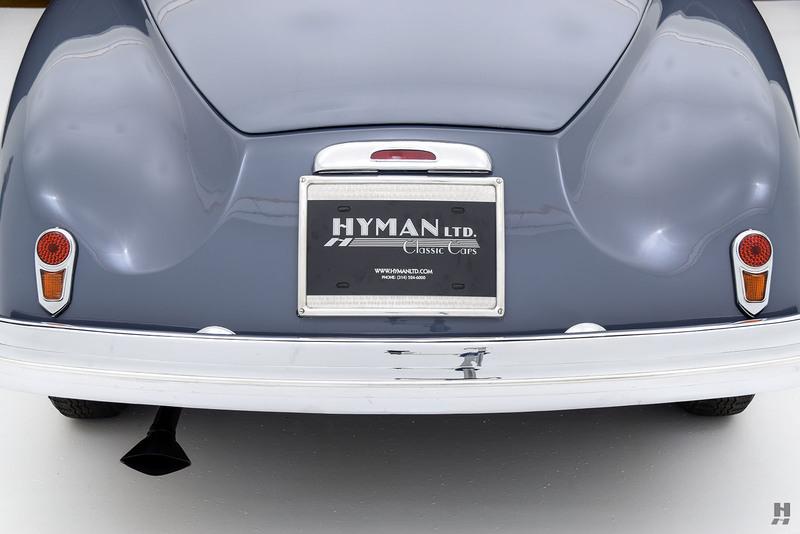 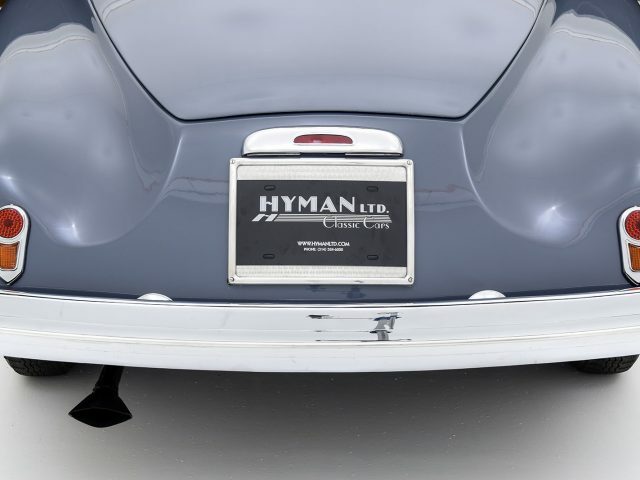 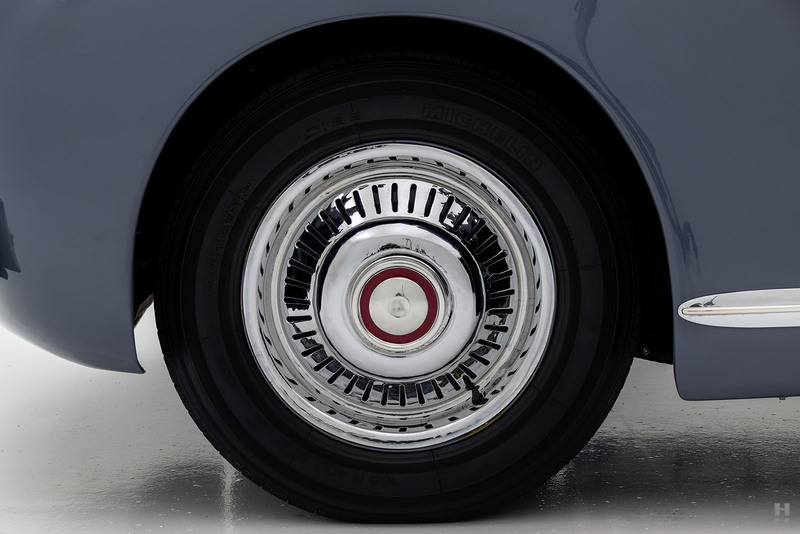 We are particularly fond of the subtle “Pinin Farina Speciale” badges that adorn the flanks and the unique chrome turbine-style wheel covers. 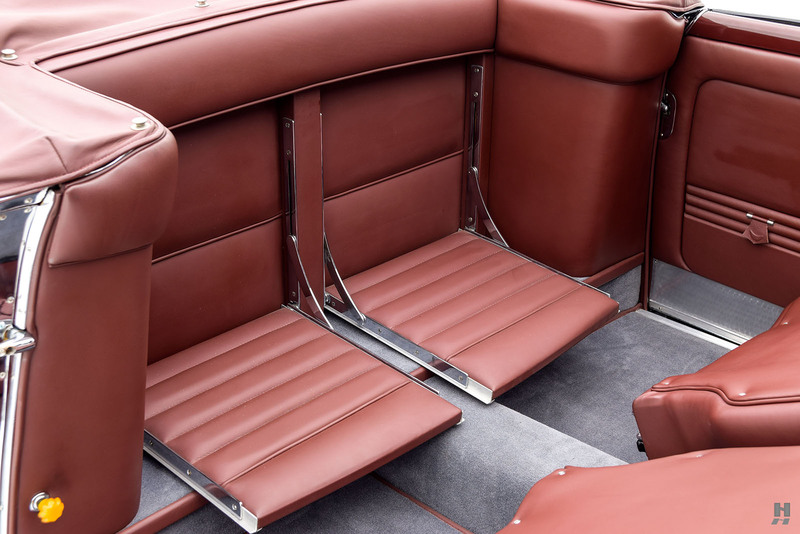 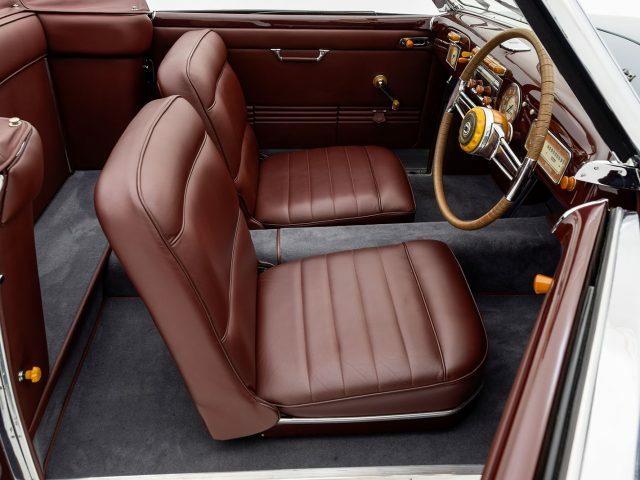 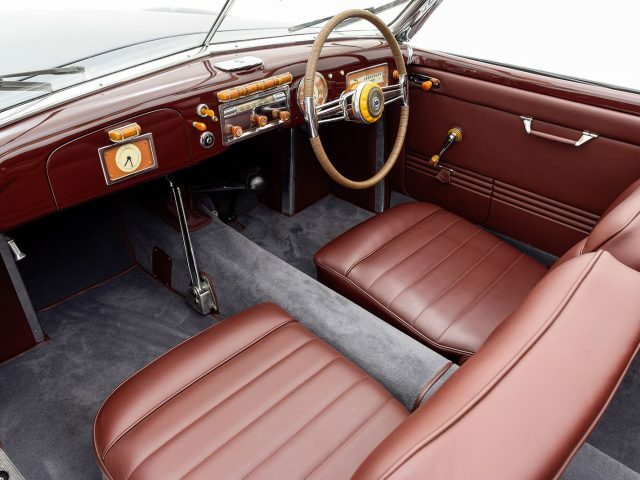 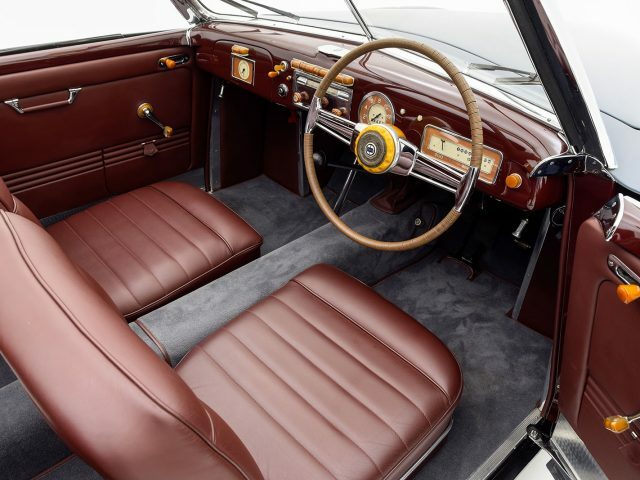 The interior is equally beautiful and finely crafted, featuring deep burgundy leather seats in front, with a pair of folding jump seats in the rear. 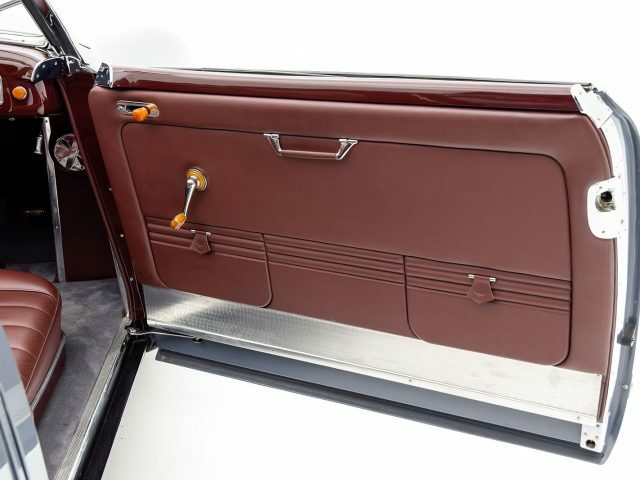 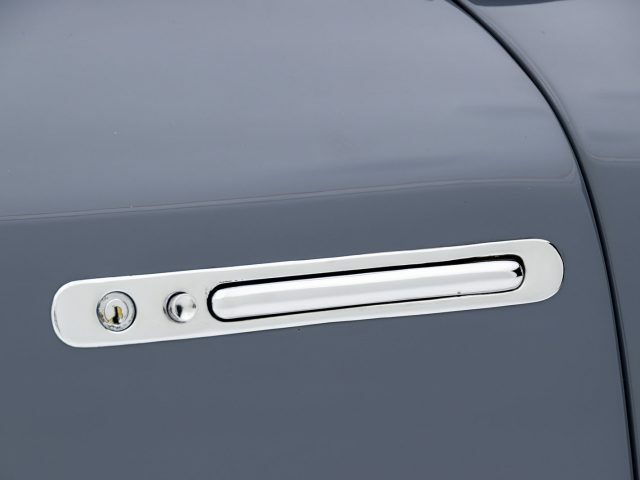 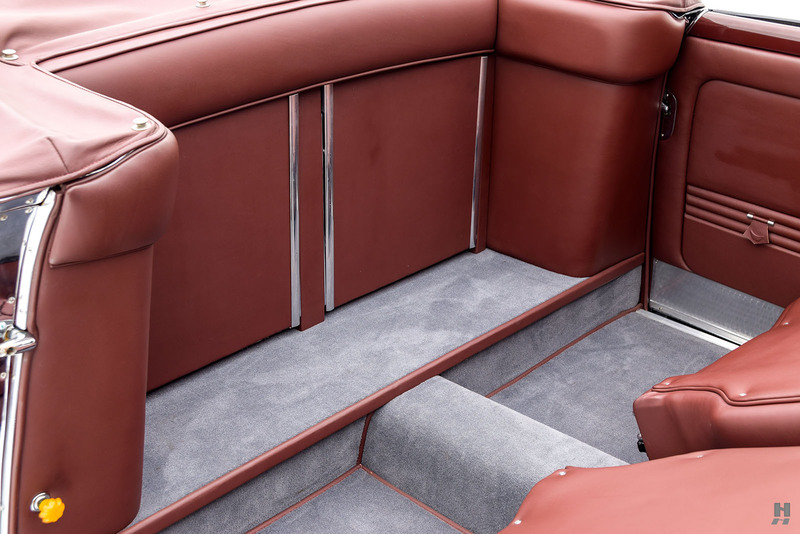 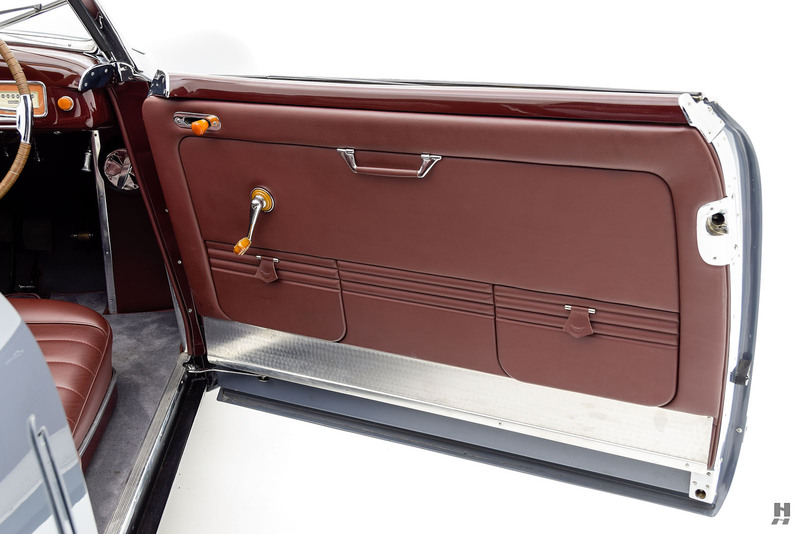 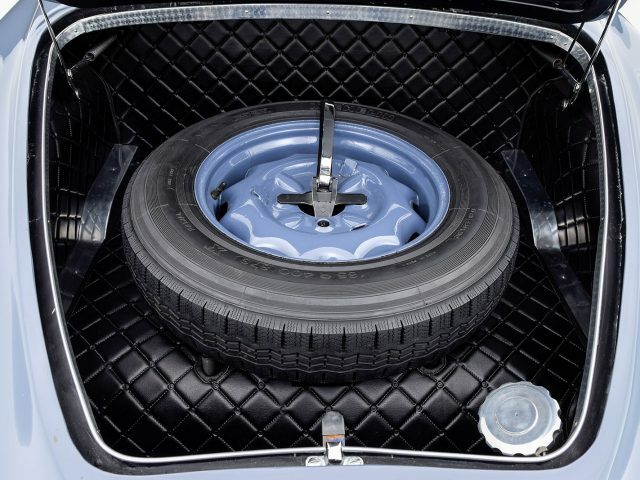 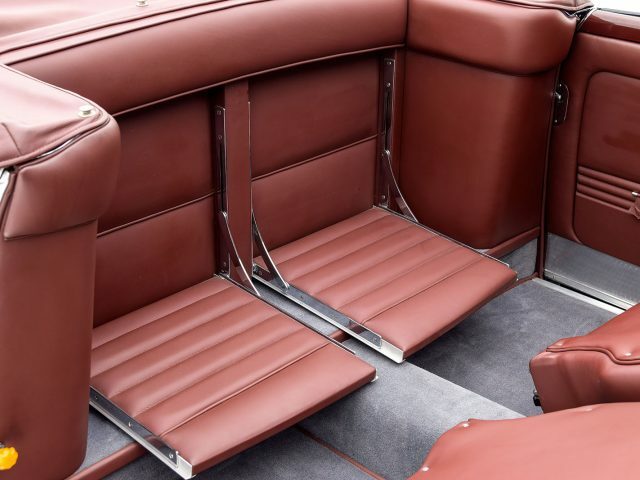 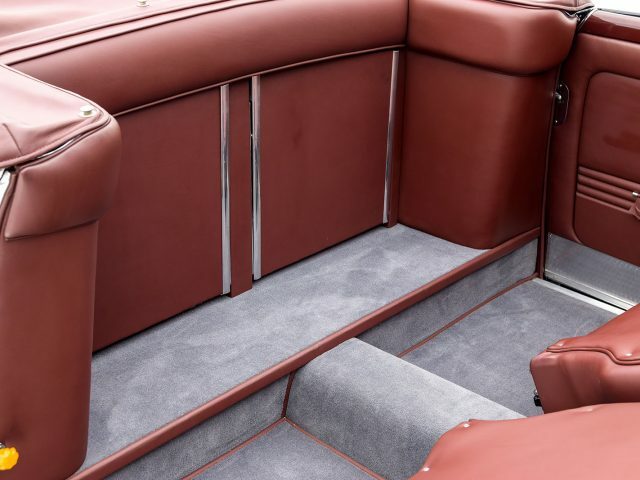 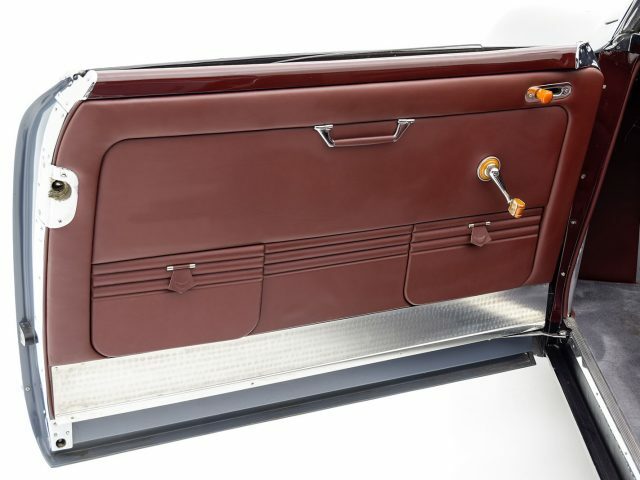 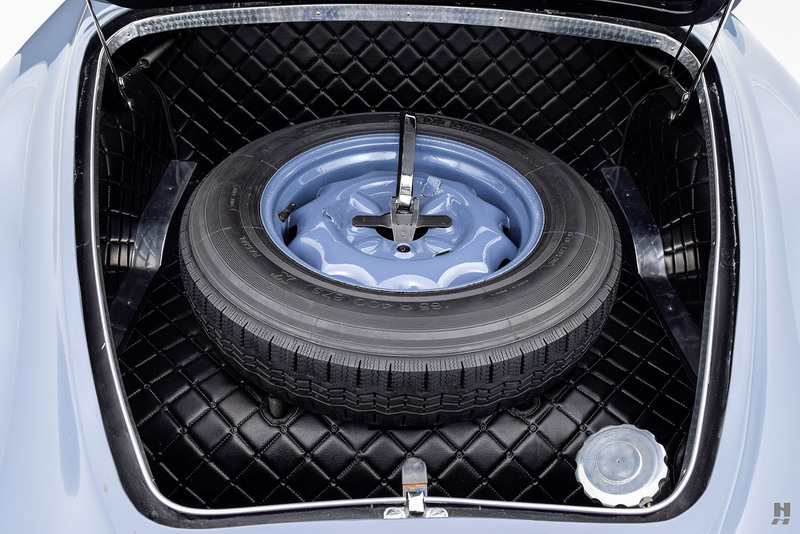 The door panels and top boot are finished in the same supple leather, and the carpets are in an attractive blue-gray to complement the paintwork. 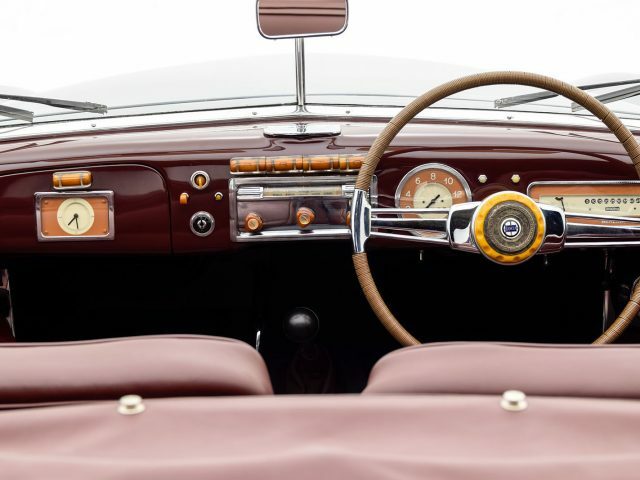 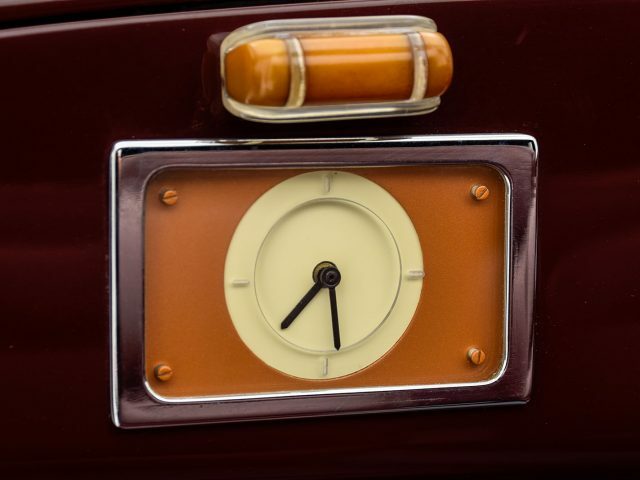 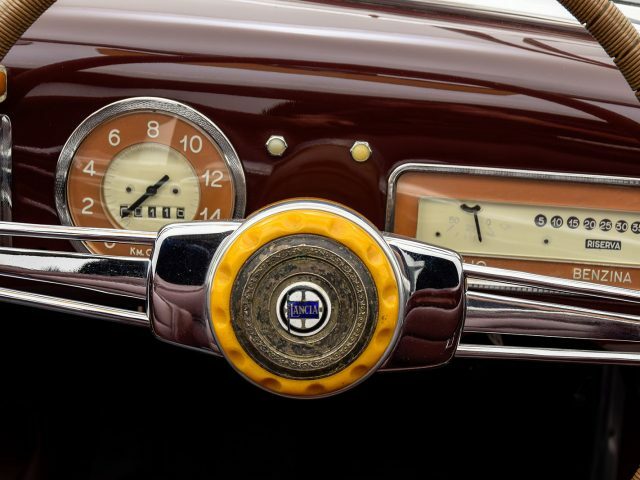 A highlight of the cockpit is the stunning dash – a finely composed design executed in burgundy, amber Bakelite, and chrome. 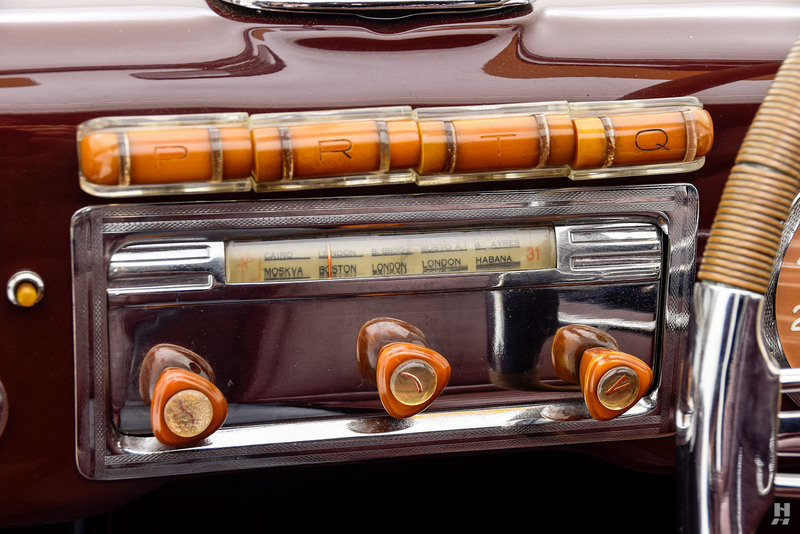 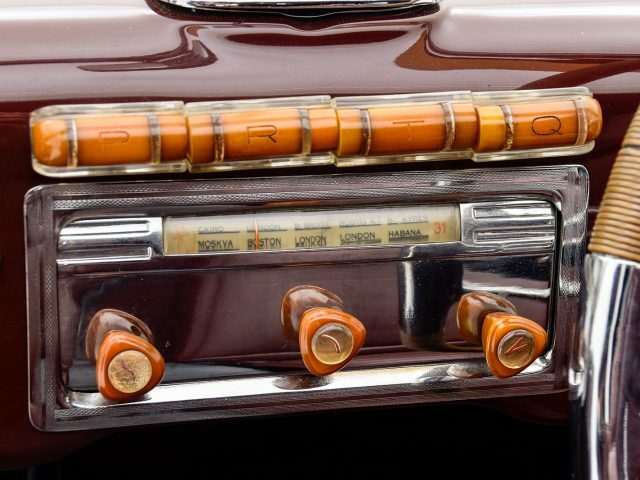 Beautifully designed instruments with cream faces and a magnificent radio adorn the dash. 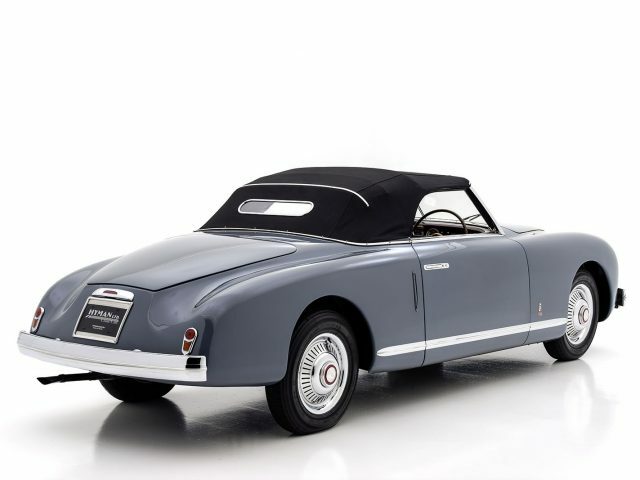 The roof is upholstered in black canvas, and looks equally as elegant in place or folded, a testament to Pinin Farina’s attention to detail. 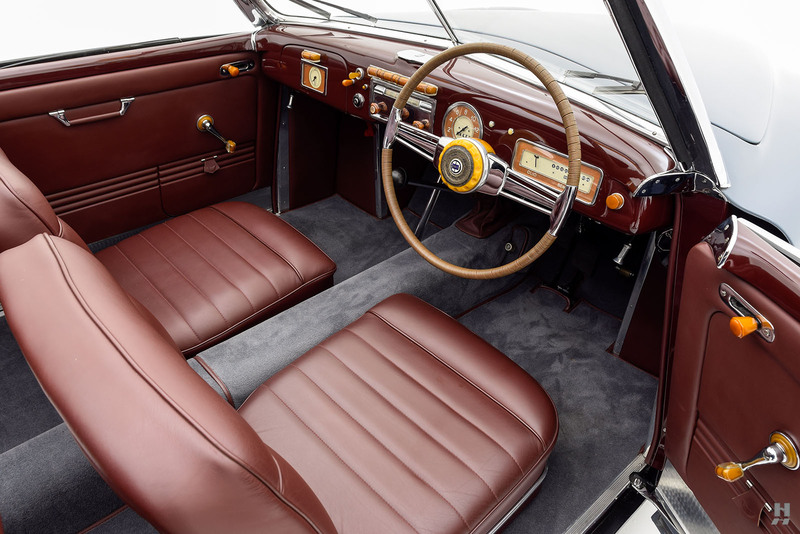 Mechanically, the Lancia is in fine order. 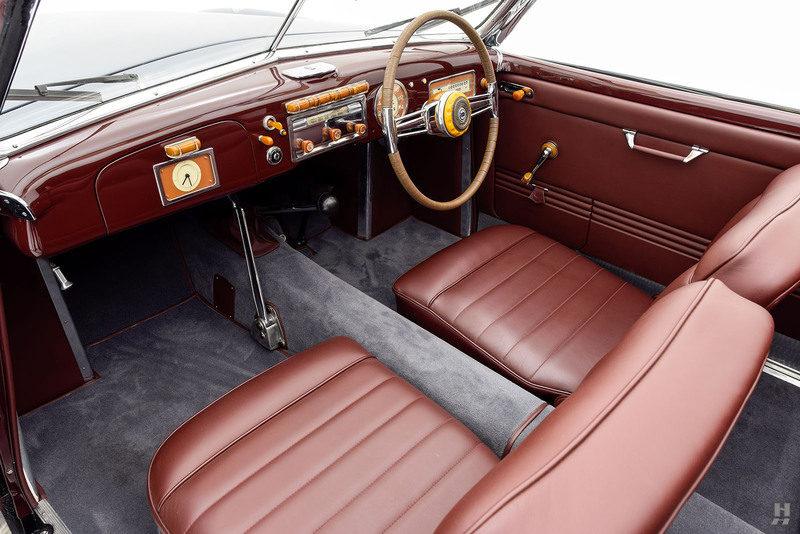 The 1,485 c.c. “Tipo 99” V4 starts readily and emits a pleasant burble from the exhaust. 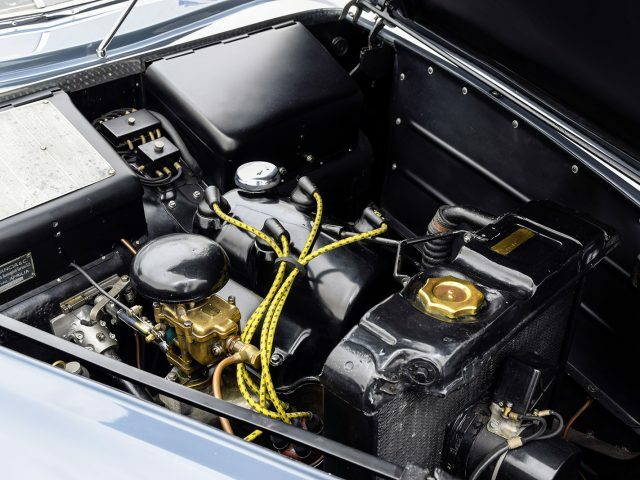 Power is sent through a four-speed gearbox with surprisingly close gates and a positive, mechanical feel through the shift lever. 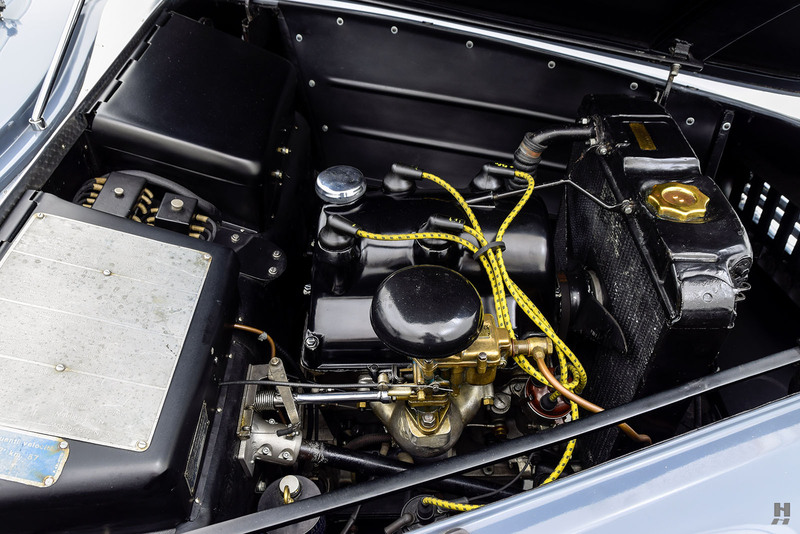 The underhood presentation is tidy and highly correct without appearing over-restored. 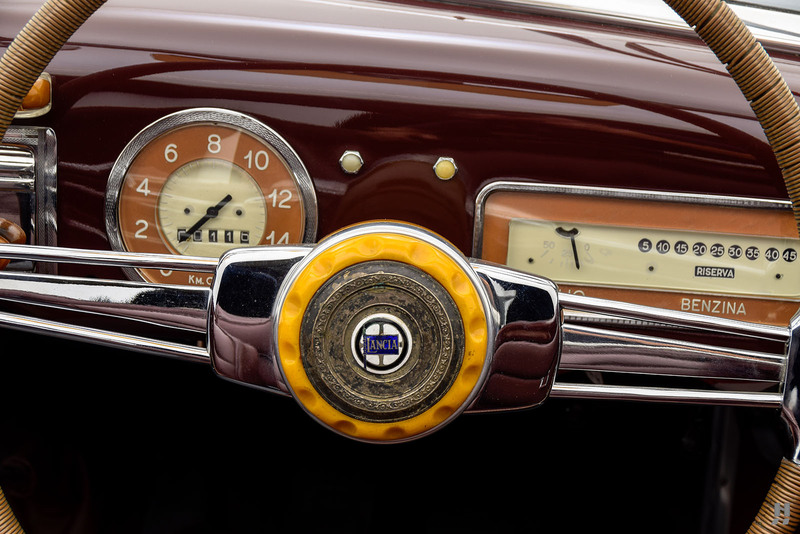 Pleasing details include the original lubrication labels on the bulkhead and original Lancia ID tag. 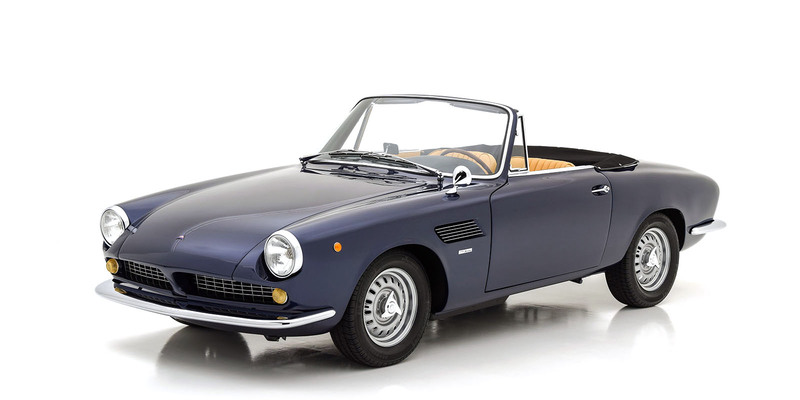 Standard Aprilias came equipped with a Zenith 32 VIML carburetor, while this car wears an era-appropriate brass-body Weber 30DR3, perhaps replaced in period for improved performance. 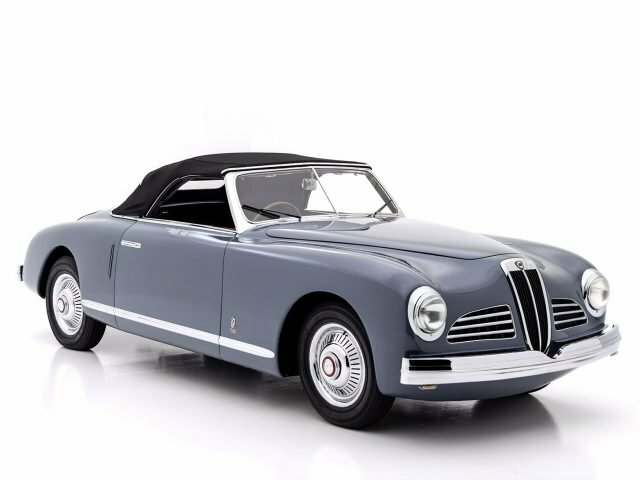 Since its restoration, it has been shown on limited occasions, including one special tribute to Pininfarina held in London in 2013, where Sergio’s son Paolo got behind the wheel in an emotional tribute to his father and grandfather. 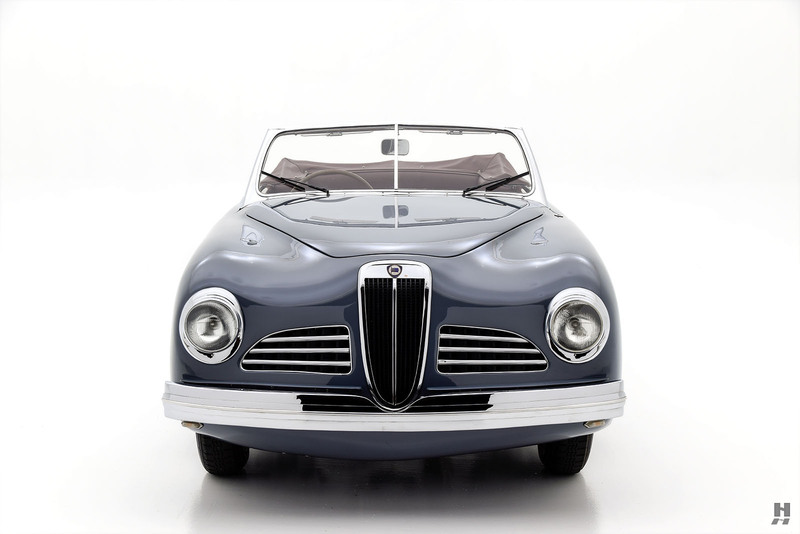 This Aprilia represents a truly unique opportunity to acquire a ground-breaking creation from two of automotive history’s most brilliant, forward-thinking designers – Battista Pinin Farina and Vincenzo Lancia.